Where in Australia did you hail from? What AFL Team do you support? Do you follow any North American Team? if so who/why? What is your favourite and least favourite things about Toronto? What are your thoughts on playing footy over here? You were one of the Div 2 guns last year, what was it like scoring 21 goals last season and what was your favourite overall? Your words not mine, but thanks, yes I probably was! Probably kicking just 1 more sausage roll than Tinks was the most satisfying part of that stat. 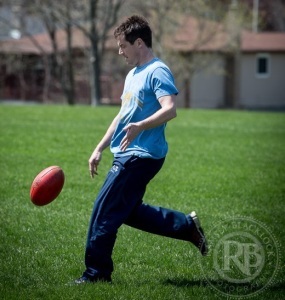 What do you love the most about being a part of the Dingos Football Club? I really enjoy Alvin's creative stories. I'm not convinced they were all 10/10's like he says they were, or even all female for that matter; but it provides good background noise while tipping a few crisp Molson's down the gullet, after a grueling 48 minutes in the Scooby-do's. What has been your best moment/event with Dingos so far? I enjoyed the energy and enthusiasm leading up the GF last year, with both sides involved. And that Tinks did not get a vote in the Magoo's B&F, despite preparing an acceptance speech "just in case". You are very involved with the ICC but which is your preferred sport to play/watch.. Cricket or Footy? Love them both, although body is starting to be more conducive to cricket now I'm the wrong side of 25. Overall what would you like to achieve this year with the club? Mainly some good comradery, and hopefully assist a few of the lads that are new to the game to improve to the point that they want to stick at it. Who is your favourite dingo and why?